FIGGY is just a pup, right under a year old & as sweet & as innocent as they come. His is a disturbing story of many that pushed their responsibilities aside, leaving FIGGY to suffer the ultimate betrayal. It is a MIRACLE he is even with us today. We are not sure exactly what happened to this little guy that got him to where he is today, the stories have changed so many times & nothing really seems to add up. But to the best of our ability…here is what we know. FIGGY belonged to some folks in a rural part of the state just outside of Las Vegas NM. They took him to the City of Las Vegas shelter (prior to it being taken over by our sister rescue The AWC on 9/1/13) to request euthanasia. They were denied, turned away stating they were “full” & that there was no one there that could help them. They were, however, given the # to contact The AWC. FIGGY was taken home & put back on his chain….severely injured, paralyzed & unable to walk, open wounds full of maggots & emaciated. It would be days before FIGGYS people contacted The AWC & when they finally did, The AWC rushed over to his rescue! What they found was unspeakable! You can only imagine the sight of this baby, chained to a cement slab, covered in maggots & in great distress (pics of his original location are unavailable due to a camera malfunction). There were also multiple other chained dogs on the property that would need to be addressed, but at a later time. FIGGY was of the utmost urgency! That is when I got the call. An AWC volunteer would drive FIGGY to our vet in Abq where I would meet them & get FIGGY the care he so desperately needed. When I first laid my eyes on this broken & defeated baby dog, I felt them fill with tears (although I work hard not to cry, the tears ran down my face). What the hell happened to this kid? How could anyone leave him in this condition? How was he failed so terribly by humans? How would we ever make him whole again? These are some of the thoughts that ran through my mind. As I reached in to scoop him up…he screamed, he tried to hide & he bit! This poor baby had no idea what was going to happen, he was terrified, in pain & he really just wanted to run away. But he couldn’t, he couldn’t even walk. We got him into the clinic, got pain meds & fluids on board & began the job of cleaning & assessing his wounds. What we found were 100’s, maybe 1000’s of maggots in his many superficial wounds, in the abrasions of his tummy where he had been dragging himself & his scrotum which was swollen to 3 times the size. It was touch & go as to what would be in FIGGYS best interest after all of the suffering he had endured. His spirit was broken, his body was broken & he was full of infection & fever. But after spending about 1/2 an hour with him, looking into those eyes, comforting him & feeling him beginning to trust us….out came the words “Let’s do whatever it takes. 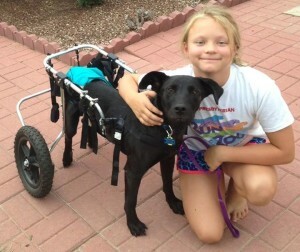 We can do this & so can FIGGY!” & so…his NMDOG journey began. There are a lot of things I could take the time to write about here. The lack of responsibility, the lack of accountability & compassion, the lack of concern & care that got FIGGY to where he was when we first met him. But why? I think I would rather focus that energy & effort on telling you about HIM & the AMAZING Angels that were brought into his LIFE instead (& there are many). But here is what I do know (or dont know, as the case may be). We were told that FIGGY was hit by a car. But he was chained. So was he hit by a car on his chain? Did he get loose form his chain? Or…was he never hbc, but rather, were these injuries sustained at the hand of a human? We were never able to get any straight answers & thankfully those that turned him away are not in a position to do that anymore! 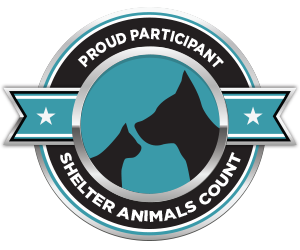 The Las Vegas, NM shelter is now in the caring, capable & compassionate hands of the AWC (Animal Welfare Coalition of Northeastern NM) & for that we are beyond thankful!! Here is where we are with FIGGY today. FIGGYS xrays showed no signs of fractures or breaks. He spent some time with our TEAM at Good Shepherd Animal Clinic, receiving the strengthening care he required, meds in the hopes that a suspected spinal trauma would heal & that FIGGY would regain usage of his rear legs, good food to nurture his body & the care & attention he was so clearly denied. Although FIGGY made great strides while at GSAC & was surrounded by LoVe for the first time ever in his life….he gained weight & his superficial wounds began to heal, as did his spirit…we soon accepted that this protocol was not enough for FIGGY & that we were dealing with something much more serious. We reached out to our friends Dr. Hady (rehabilitation Guru!!) & the Oscar Foundation in order to get FIGGY seen by the specialists that would best be able to diagnose & treat his condition. The Oscar Foundation graciously contributed $500 to get us started with Dr. Hady & her TEAM. 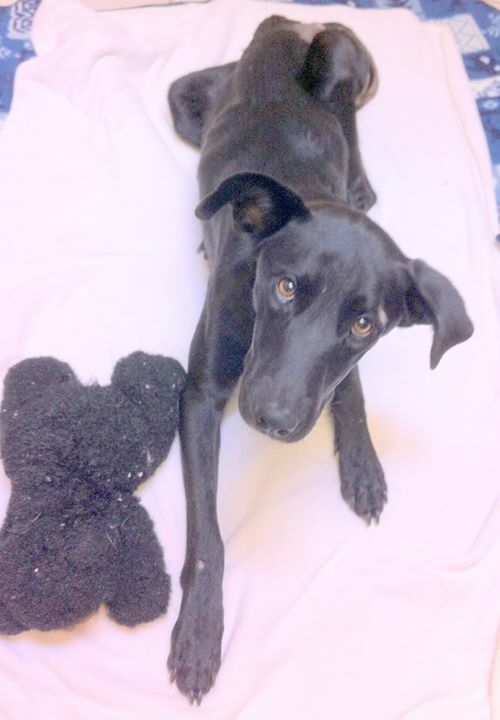 There are many more months of care that FIGGY will require & that means much more than $500. We are blessed to have Dr. Hady on our TEAM (as well as her previous assistant who is currently fostering FIGGY in her home, providing him with his daily PT & meeting his special needs). Dr Hady loaned FIGGY a new cart that suits him very well…he actually LOVES zooming around!! 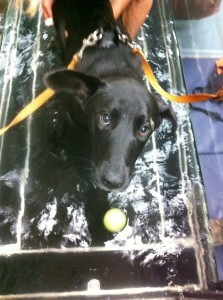 FIGGY sees Dr. Hady twice a week to do hydrotherapy & maintains a treatment plan under her orders. FIGGY was not an easy save. FIGGY is not a dog that people will be fighting over to adopt. 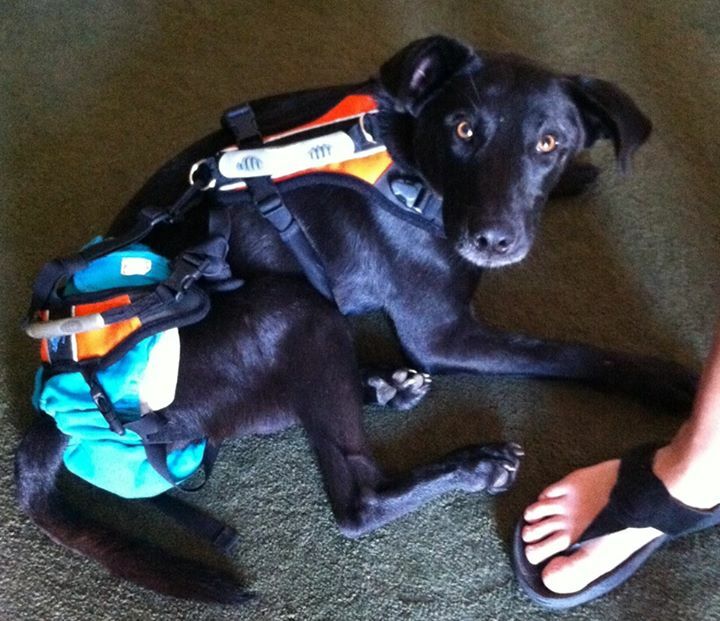 FIGGY will have special needs his entire life & he may never be able to walk on his own. But FIGGY is special. FIGGYS eyes told us he wanted to live. FIGGY is happy with the LIFE we have given him (& our hope for many long, happy & healthy years) & we will have faith that someone just as special as him will find him & fall in LOVE! Everyone that meets FIGGY sees what we see…a sweet, grateful, easy going kid that is happy to be alive & who has a bright future ahead. We have seen Miracles happen for many of our dogs…why should FIGGY be any different. He deserves a Miracle too! 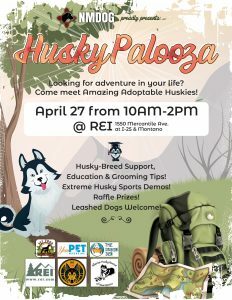 Each year we seem to receive at least one dog in need of “above & beyond”! In 2011 it was CHEYENNE. In 2012 it was SHERIFF. 2013 has brought us FIGGY! We are committed to FIGGY to give him the LIFE he only dreamed of as he laid at the end of his chain….the LIFE he deserves! But we need YOUR HELP!! NMDOG is an all volunteer, foster based, 501(c)3 rescue serving the chained, the abused & the most Forgotten Dogs of NM! FIGGY was certainly “forgotten” 🙁 We are able to do this lifesaving & important work because of the support of those that believe in our Mission. Those that contribute to the dogs in our care & donate the funds required to meet their needs are the backbone of the work we do! You can also call a payment in directly to Good Shepherd Animal Clinic (505)884-3200 & let them know it is for NMDOG & those we serve. THANK YOU to those that donate, foster, adopt & volunteer….it is because of YOU that we are able to do the good work we do! Figgy in his wonderful foster home. FIGGY has a long & expensive road ahead of him. But he now has the entire NMDOG Village to walk that road with him! We expect FIGGY will need at least 8-12 more weeks of intensive therapy sessions with Dr. Hady, along with the continual care & PT he receives in his special needs foster home. None of this comes cheap, not to mention the weeks of initial stabilizing care he received at GSAC, specialized harness & exercise equipment, cost of diapers, food, meds, misc supplies & the eventual purchase of his very own custom cart! (for now he has one on loan from Dr. Hady) There may come a time when we need to update FIGGYS chip in amount, But we have faith that we will be able to provide for all of FIGGYS needs until his special Angel finds him & calls him their own….because we have The Village & The VILLAGE ROCKS! Stay tuned for video updates on FIGGY! Clips of him zooming around in his turbo cart! Special appearances at Oscar events & updates on the progress he is making!! We got a little bit of a late start introducing him, but we plan on taking all of you with us on FIGGYS GREAT ADVENTURES! So climb aboard the FIGGY TRAIN & buckle up for your own safety 🙂 we are right on track!! Everyone who meets Figgy falls in love with him! Again & it deserves another mention….THANK YOU to the amazing people that are always there for us & the dogs we serve! Without you, we are nothing. For FIGGY, a special “WooF Out” to the volunteers of the AWC for being right where you are supposed to be & for getting FIGGY out of the hell in which you found him! To everyone at Good Shepherd Animal Clinic, for your unconditional LoVe of NMDOG & our dogs!! To Dr. Hady for her accessibility & support in new uncharted territory for us here at NMDOG! To the Oscar Foundation for the good work you do for so many & for your contribution to NMDOG for FIGGYS care!! And…to a couple of very special humans in FIGGYS life; His foster Mom & PT nurse, without you we would be lost!! To FIGGYS special “Grandpa” (WooF! Wag & Walk!!) who gave him the one on one attention & care he needed in the beginning!! FIGGY will carry your LoVe with him for always!! We are grateful to each of you…with all that we have!! If you are interested in adopting this AMAZING BOY who will give your life purpose & JOY…please send an email to adopt@nmdog.org We will take great care in FIGGYS placement & we will provide you with a whole TEAM of support! Get this: FIGGY now has his own YouTube playlist! He really is quite the little superstar! 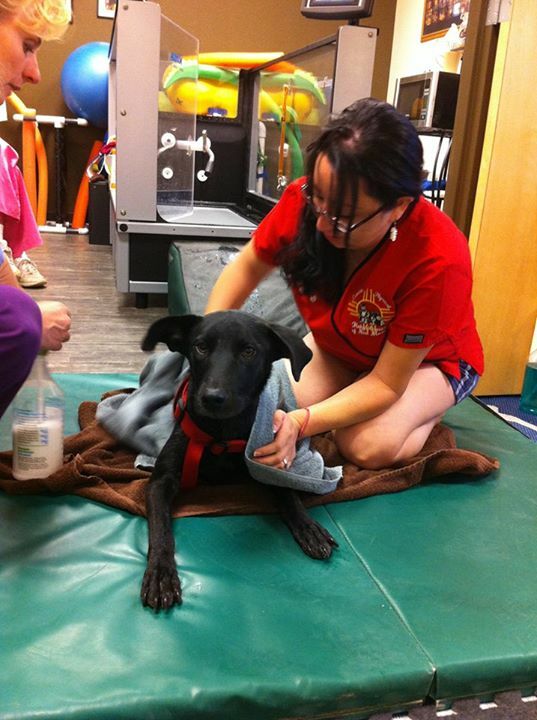 Now you can be part of his journey through hydro-therapy, the first time in his turbo-cart, and much more!